1920s polished black tower shop cabinet. 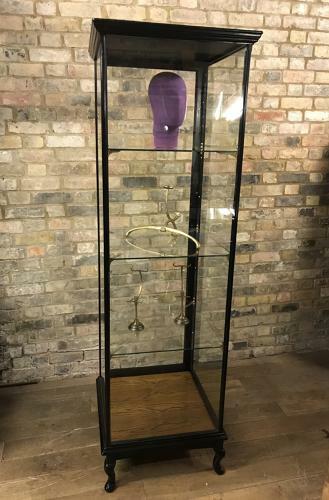 This is a lovely tall thin shop display cabinet that looks lovely in the middle of the room, shop or against the wall, it has three adjustable glass shelves on brass brackets, the cabinet has very nice cornice and lovely legs. All glass is toughened safety glass, and more shelves can be added at extra cost.